It rained, but it was colder than what it should be to be raining. A combination of warmer atmosphere and colder temperatures on the ground produced an ice storm. It hit over the weekend so I could sit quite comfortably by my fireplace and watch out the window as the rain formed into sheets of ice on the streets and sidewalks. Power lines thickened as they became cubed in ice. Foot long and longer icicles dangled and swayed from the power lines, from the eaves of houses, from signs, from fence lines. The most affected though were the trees. The bigger the tree with the thicker branches, the more affected they would be. The ice accumulated on their branches bending and twisting them down to the ground. They became monsters, slumbering beneath an armour of ice. I’d been thinking about rereading Beowulf for some time. This story has been a part of me for almost as long as I can remember. I read a child’s version when I was young, several times before moving on to other more adult translations. The idea of a man taking on a monster, much stronger than most men, and finding a way to defeat him was compelling mythology for my young mind. The terror of it, the monster that comes into your home and kills in the dead of the night and takes heads as trophies, left shivers in the very center of me. Beowulf hears of a monster who is attacking the Danes. He is one of thirteen men who decide to go to the rescue of Hrothgar, King of the Danes. He goes because he needs to make a name for himself, as Buliwyf in the movie The 13th Warrior says: ” I have only these hands.” Beowulf is poor, renown for his strength, but he has no Hall to call his own and, but for this small band, no men to call him King. I had spent most of the day finishing another book and, thus, had started reading Beowulf late in the evening. The wife and my Scottish Terrier had gone to bed, and I was left in the soft glow of my reading lamp. Most of the city had lost power as lines too heavy with ice had crashed down one by one. I had candles close to hand. It never crossed my mind, power or no power, that I would go to bed. Beowulf was written in Old English between 975-1025. The Seamus Heaney translation that I read had the Old English on one page and Heaney’s translation on the other page. In college, I took a Chaucer class and became a fair hand at deciphering Middle English, but looking and even pronouncing these unfamiliar words did not ring any ancient bells in my English soul. I would have had better luck reading Greek than Old English. 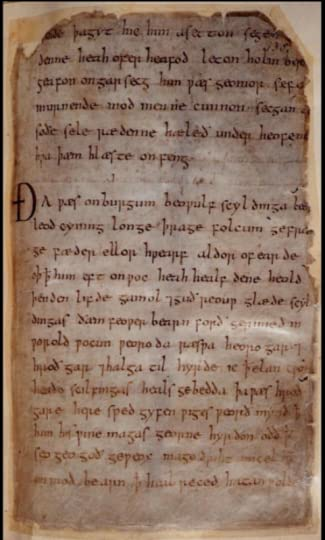 1,000 year old manuscript of Beowulf. As Beowulf grapples with Grendel and then with Grendel’s mother, I was just as enthralled with the story as I was as a wee tot. The carnage, the darkness, the uncertainty that Beowulf had to feel, despite his boasts to the contrary, all lend a fine, sharp edge to the tale. As I read, I also started to hear the sharp cracks and howls of ice heavy tree limbs separating from their trunk in much the same way as Beowulf pulls Grendel’s arm loose from his shoulder. The crash of these ice shrouded branches against the frozen ground sounded to my mind like the steel swords of the Geats banging against their metal wrapped shields. Curiosity got the better of me, and I walked out of my back door into an alien landscape. Each individual stem of grass had frozen into a nub of ice. With every step, my boots crunched and slipped across this icy topography. Piles of limbs laid at the bottoms of the bigger trees. A small limb detached from the cottonwood tree as I stood there and made discordant music as it hit the limbs below before finally landing among its fallen, dying brethren on the ground. The younger trees, more limber, were probably fine, I told myself. They are bowed over as if in supplication to Mother Nature. Their top branches were frozen to the ground, making arches of their shapes. It was all very beautiful. I remembered reading about a party that was given for Anastasia, the Russian princess, before her life became tangled in the turmoil of revolution. The servants were outside spraying water on the trees so they would glitter with ice as the aristocracy arrived on their horse pulled, bell laden sleighs. I just loved that…feud-calloused hand. I also really liked..”your blade making a mizzle of his blood.” There are lines like that all through the story. Words unfamiliar and evocative of a different age. Beowulf does age and does need the help of others in the end when he battles a dragon, but few men are made with the courage that he is, and they fail to help him when he needs it most. He does kill the dragon, but at the cost of his own life. Stormy weather requires the proper book and a proper, hot, Scottish tea laced with a few drops of Scotch whiskey. For me Beowulf, those 3,182 lines, added enchantment and necromancy to a world transforming before my eyes into something magical and unknown.